On 7 October 2015, the Gepard class frigate and three Buyan-M class Russian Navy corvettes, part of the Caspian Flotilla, launched 26 Kalibr-NK system cruise missiles 3M14T from the Caspian Sea at 11 targets in Syria. The missiles traveled 1,500 km (932 mi) through Iranian and Iraqi airspace and struck targets in Raqqa and Aleppo provinces – the territory controlled by the Islamic State. 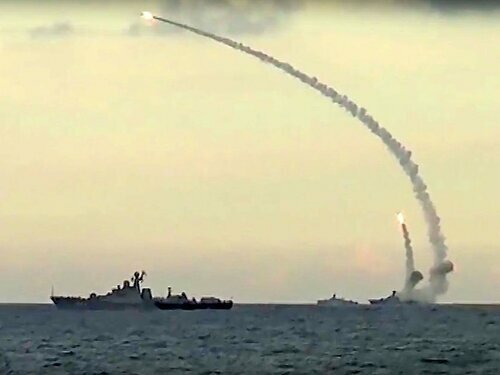 On the 20th of November 2015 Russia launched 18 3M14T cruise missiles from Caspian Sea onto targets in Syria. On the 9th of December 2015 Russia fired a group of 3M14K cruise missiles from Kalibr-PL system at Islamic State positions from the Improved Kilo-class submarine B-237 Rostov-on-Don deployed in the Mediterranean. It was the first real-world test of its Kalibr land attack cruise missile – a game changer, making Russia a member of the elite club of countries. By launching its first combat strikes from a submarine, Russia demonstrated to the West that it now has the capability formerly monopolized by the US and its allies. The Kalibr 3M-54 (NATO codename – «Sizzler», SS-N-30A) is a long-range, low-flying cruise missile capable of carrying conventional or nuclear warheads. It has land-attack, anti-ship and anti-submarine variants. The missile has a second stage that performs a supersonic sprint in the terminal approach to the target, reducing the time that target's defense systems have to react. The Kalibr is designed to share common parts between the surface and submarine-launched variants but each missile consists of different components, for example, the booster. The missile can be launched from a surface ship with a Vertical Launched System (VLS) and a booster with thrust vectoring capability. The missile launched from a submarine torpedo tube can use a conventional booster instead. The air launched version is held in a container to be dropped after the missile is fired. During its terminal phase, the missile locates its target through a mix of coordinates and onboard image recognition, essentially matching an uploaded image of the target to what the missile sees in front of it. If all goes to plan, the missile’s 1,000-pound payload of high-explosive is then guided straight to the target for a violent impact. • 3M54K (SS-N-27A) – a submarine launched missile anti-ship missile. Its basic length is 8.22 m (27.0 ft.), with a 200 kg (440 lb.) warhead. The range is 440–660 km (270–410 mi). The missile is a sea-skimmer with supersonic terminal speed (Mach 2.9) and a flight altitude of 4.6 metres (15 ft.) at its final stage. • 3M54T is deployed on surface ships equipped with VLS launchers and thrust vectoring boosters. The performances are the same as the 3M54. • 3M14K is an inertial guidance submarine-launched land attack variant. The weapon has a basic length of 6.2 m (20 ft.), with a 450 kg (990 lb.) warhead. Its range is 1,500–2,500 km (930–1,550 mi). The subsonic terminal speed is Mach 0.8. • 3M14T is the inertial guidance surface ship-launched land attack variant with VLS launched missile and thrust vectoring booster. The basic length is 8.9 m (29 ft.); its warhead weight and other performance are the same as the 3M14K. 26 3M14T cruise missiles of this variant were fired from four surface ships in the Caspian Sea on 7 October 2015. The Russian Kilo class, Lada class, Akula class, Yasen class, Borei class are the submarine launch platforms for the missiles. The Russian Admiral Gorshkov class, Admiral Grigorovich class, Gepard class frigates are able to carry these missiles. The Russian Gremyashchy class, Buyan-M class, the second batch of Steregushchy class corvettes are low displacement platforms with Kalibr system ability. Also the Indian Talwar class frigate is another shipborne launch platform for the Kalibr missile system. It’s worth to note that Russia has launched its strikes from surface platforms much smaller than US long-distance strike capable destroyers or cruisers. This unique feature is especially important. «This was not a missile seen as being normally carried by the corvettes, which had [shorter-range] Klub missiles as opposed to the land-attack version», said Bryan Clark, a naval analyst with the Center for Strategic and Budgetary Assessments in Washington. According to the expert, the Kalibr, «changes it from being a sea-control ship to one with distributed lethality. The US has been aspiring to that, but the Russians have shown they already have it». The operation was a good demonstration of the concept of distributed lethality, Clark noted, where weapons and sensors do not need to be concentrated on a few large platforms but can be spread out to multiple units. «We have a new class of ships that we’re not equipping with anything that’s like this missile», bemoaned Clark. «The (US) Navy should feel embarrassed that they let this happen». The Buyan corvettes have a displacement of less than 1,000 tons at full load. For comparison, the US Arleigh Buke class destroyer has the displacement of 6900 tons. The corvettes are small enough to operate in Russian rivers: the Volga, the Don etc... The Volga and the tributaries form the biggest riverine system in Europe. The Moscow River is part of it. The Volga is connected to the Caspian Sea. The Buyan class corvettes based in the Caspian Sea can use the riverine ways to operate in different areas. Moscow is itself linked to this system through the Moscow Canal, which is why since 1947 it has called itself «the port of five seas» – the Black Sea, the Caspian Sea, the White Sea, the Sea of Azov and the Baltic. Therefore, Russia has demonstrated a capability to launch water borne cruise missiles from a vast expanse of their territory – probably from most regions of European Russia. The ship-borne long-range Kalibr systems moving along the rivers don’t violate the Intermediate Forces Treaty (INF), which bans only ground-based intermediate range missiles. The NATO missile defense sites in Romania and Hungary could be potential targets. It should be noted that, unlike their Western analogues, the Russian cruise missiles, even those developed years ago, are all supersonic to enhance their ability to penetrate the enemy’s missile defenses. Since the Buyan corvettes are highly mobile, it will be difficult to keep track of them. The appearance of the long-range Klub/Kalibr cruise missiles and Russia’s proven ability to launch them from small ships is therefore dramatically changing the military balance in Europe. «We now see that these are new, modern and highly effective high-precision weapons that can be equipped either with conventional or special nuclear warheads», Russian President Vladimir Putin said about the missiles at the time. «This very low-flying, fast missile» – as retired Adm. Eric McVadon, formerly US naval attache in Beijing, once described it – «can perform sharp-angled escapes and other advanced maneuvers shortly before reaching its target, a naval intelligence manual states. It could sink US aircraft carriers». «The new technologically advanced Russian Navy, increasingly armed with the Kalibr family of weapons, will be able to more capably defend the maritime approaches to the Russian Federation and exert significant influence in adjacent seas», the December Office of Naval Intelligence report said. Ruslan Pukhov, director of the Centre for Analysis of Strategies and Technologies, said, the Syrian operation had affected Russian arms sales «extremely positively» by showing Moscow has effective weapons and can challenge western influence. «Russia basically proved it has political will, it has balls, because normally people don’t buy weapons from losers», he added. Indeed, the export variant of the missile (Club-S) is a success. India, Algeria, Vietnam, China have submarine-launched (mainly Kilo-class Russia-produced diesel submarines) export versions of the system in their inventories. Iran is reported to negotiate a deal. The export variant has a maximum range of 220 km. The Kalibr missile is a weapon that has caused jitters in the West. The weapon is changing the calculus of the reach and effectiveness of smaller naval combatants and submarines. The use of Kalibr during the Syrian conflict demonstrated that today Russia is second to none when it comes to long-range precision strike capability.